If you’re reading this and understanding the nuances of what I’m saying, then I can safely assume you’re human. That means you’re a mix of Oxygen, Carbon, Hydrogen, Nitrogen, Calcium, Phosphorous and traces of other elements. While true as a statement, that doesn’t mean you wouldn’t be upset to be introduced like that at a party. You’re more than the sum of your parts, and those atoms of yours have experience of this thing called life. 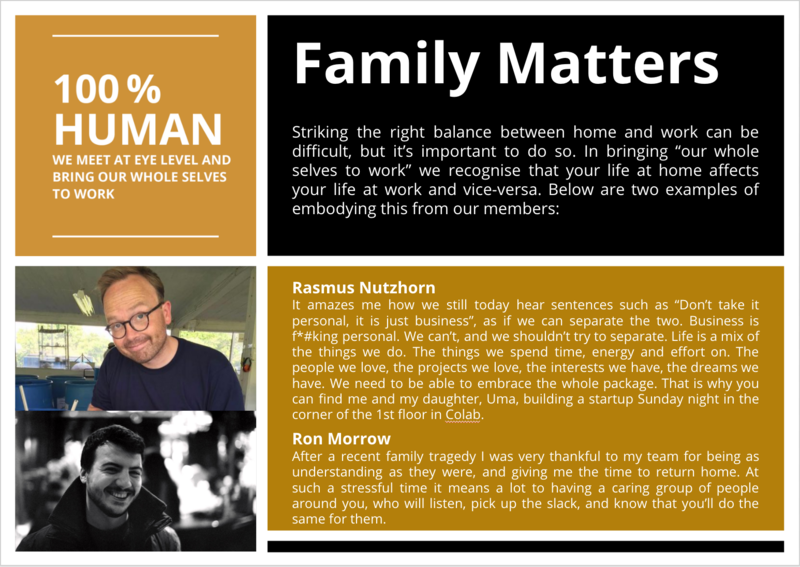 As part of our recently created Co-Manifesto I have become the guardian of principle “100% Human”. For the last month I’ve taken the time to gather stories from our community and ensure that we’re meeting “at eye level and bringing our whole selves to work”. In doing so, we’re trying to ensure we recognize what makes each of unique and that we’re not just another nameless resource. The stories I’ve collected have ranged from the very personal to the very pragmatic, and I’ve been able to see that the Hub hosts all kinds of personalities within its ecosystem. In talking to Rasmus Nutzhorn I was introduced to the phrase “Business is f*#king personal” and how it is impossible to separate the personal from the professional. From personal experience I’ve seen how effective it can be to be surrounded by a group of individuals who are ready to pick you up when events happen that simply can’t be confined to life outside of work. Within our community there are people who already embody the principle and hope to learn from. Ralf Metz and his company, Me & Me, support companies in reaching their goals together with a balance between high performance and humanity, while our tribe We Shape Tech is a regular meetup for women in tech with the goal of fostering greater diversity in the field. 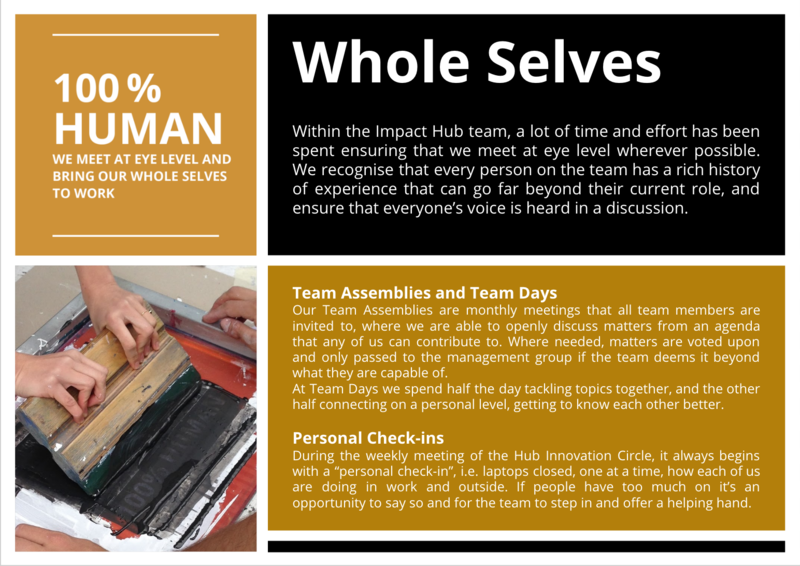 Teams within IHZ have been practicing the idea of meeting at eye level by ensuring that, as large decisions are made, we allow everyone to make their voice heard. The process can be difficult, but it’s one that is getting easier with time and allowing us to move forward as a team. 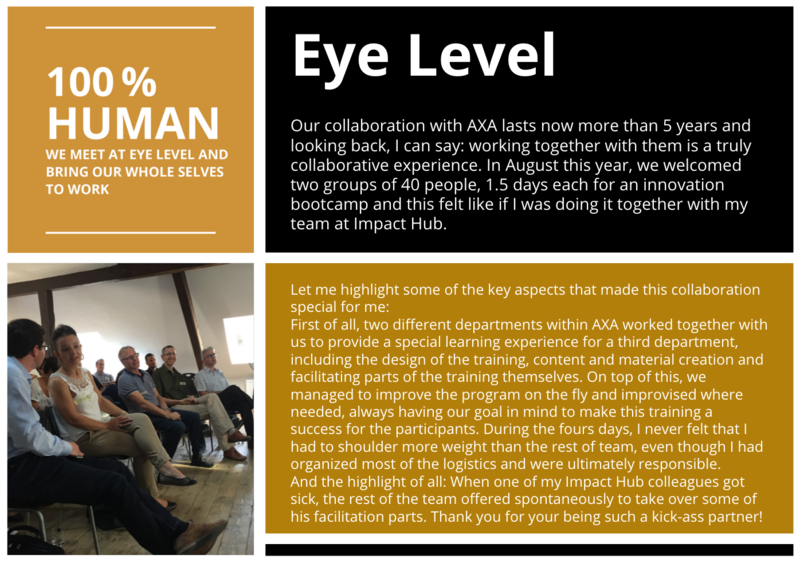 Hanna from our team has also experienced a truly „100% Human“ moment in her work with our partner AXA. How you decide to split your 100% up between work, home, and everything else is up to you, but make sure that whatever you choose it all adds up. Graduating with a degree in Integrated Mechanical and Electrical Engineering from the University of Bath in England, Ron brought his technical mindset across the Channel to join us at Impact Hub Zurich. Having worked in catering, hospitality, media, and technical fields, he is well suited to bringing them together in event management.